Discover how to quickly potty train your puppy even if you don't have any past dog training experience. Leave your puppy at home without worrying. Let your puppy roam freely throughout your home. Actually have your dog watch over your home at night instead of being locked up. Stop wasting time and money cleaning up all of your puppy's accidents. How to Tell if You're Making Mistakes When House Training Your Puppy? Potty training your puppy has to be done properly. If your dog doesn't completely understand the entire process he or she will continue to have accidents inside your home and will not understand why that's not okay. But, if your puppy does understand the potty training he or she will not use the bathroom inside your home. You've House Trained Your Dog, but He Still Has Accidents - Adult dogs can hold their bathroom urges for up to 8 hours, but if you have a house trained dog he will never use the bathroom inside again. How Old Should Your Puppy Be Before You Start Potty Training? So just how early can you start potty training your puppy? Is it best when your dog is a puppy, a young dog, or an adult dog? Well, there are two things you need to worry about when potty training young dogs. The first thing is if they have developed mentally enough to be able to understand commands, and the second is how long they can hold their bathroom urges. How Long Before Your Puppy is Intelligent Enough to be House Trained? As much as you may want to, you're not going to be able to start potty training your dog when he or she is just a few weeks old. Instead, you will need to wait until your dog is developed enough to begin to learn tricks. The best rule to go by is to wait until your dog at least knows his or her name before starting the potty training process. This will tell you that your dog can remember commands long term and is ready to learn new commands. How Long Before Your Puppy Can "Hold It" Long Enough to Be Trained? There's no sense in potty training your puppy if he or she can only hold their bathroom urges for 1-2 hours, because that would mean taking your dog outside 7-12 times each day! Normally, a puppy can hold their urges for one hour per month old they are. So a two month old pup can hold it for two hours and a seven month old puppy can hold it for seven hours. Because of this, it's recommended you wait until your puppy is at least three months old before you start training. What Are the Most Common Ways People Housebreak Their Puppies? There are many different ways people try to potty train their dog; some of these ways work and some of them don't. The below section goes over some of these methods so you can see if what you were planning on using would work or not. This seems to be a popular technique used over thirty years ago, yet does not work and creates problems hurting your training success. This technique involves putting your dog's nose close to or into his/her waste whenever they use the bathroom inside. The idea is that it's unpleasant for your dog to smell his/her waste which will make them not use the bathroom inside in the future to prevent this from happening again. Why This Doesn't Work - First off, if you didn't punish your dog while they were in the process of using the bathroom, they will not know why you are doing this and will begin to think it's normal behavior for you to do this which will make them begin to fear your presence. Secondly, even if you do catch them at the right time and punish them, they will think you are punishing them for using the bathroom in front of you. This will cause them to start using the bathroom inside in hard to find places (such as under furniture, in corners, etc. ), plus they will not use the bathroom when you take them outside for fear you will punish them. Dog potty training pads are specific (water proof) pads that you lay on your floor for your puppy to use the bathroom on. Many release a specific odor that triggers you dog's urge to potty. The idea is that if your dog cannot hold his or her urges, they will use the bathroom on the potty pad instead of your floor. The same is true for those who use newspaper for the same thing. Why This Doesn't Work - While this may sound like a good idea, there is one large flaw. Using newspapers or potty pads lets your dog think that its okay to use the bathroom inside your home. When you remove the pads, your dog will still think it's okay to potty inside. Crate training is a good way to start potty training your dog to stop using the bathroom inside. The idea is that dogs are naturally clean animals and will not use the bathroom in places they feel are their home. Unfortunately, our homes are so large that dogs cannot understand that the entire residence is our home, so they begin making certain areas of your home their bathroom spots. By crate training your dog you are giving him/her an area to call their home which will prevent them from using the bathroom inside when you're not watching them or are gone. Why This Sometimes Doesn't Work - Unfortunately, dogs are pack animals and want to be with their family. When they are put into their crate they feel as if they have been abandoned by their family and begin to cry, whine, bark, and howl. Eventually, they will fear the crate and will resist going in causing frustration and anger between you and your dog. 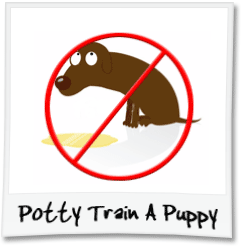 By far the most effective way to potty train your puppy is to use a combination of training methods. Now, this doesn't mean punish your dog one day and then put him/her in a crate the next. Instead it means using a combination of effective training techniques to potty train your dog. Why This Works Best - Some dogs respond differently to ceratin commands and techniques than other dogs. For example, putting your dog on a feeding schedule may be all some people need to do to potty train their dog, while other people may just need to use a crate. So by combining multiple methods into your training routine, your dog will make progress much faster and will be able to become fully potty trained in less time. Want to learn how to housebreak your dog in the shortest amount of time possible? Get the complete potty training guide for dogs and learn step-by-step exactly how to potty train your puppy so you will see results in less than 7 days. How to Potty Train A Puppy Learn everything you need to know to potty train puppies. 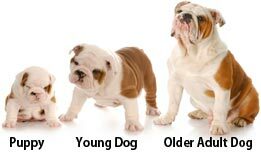 Housebreaking An Older Dog Learn how to housebreak older adult dogs easily. How to Crate Train A Puppy Get the basics to crate training puppies at home. How to Potty Train A Dog Need to potty train your dog quickly? Discover how, now! How Long Does it Take to Potty Train A Puppy See just how long potty training will take.